Spotted in game in Lakeside. Likely to be nationwide. Supposed to be the best one for a while. It's appears to be national. Checked stock on my local and it's the same price. Damn you! !It's appears to be national. Checked stock on my local and it's …Damn you! !It's appears to be national. Checked stock on my local and it's the same price. 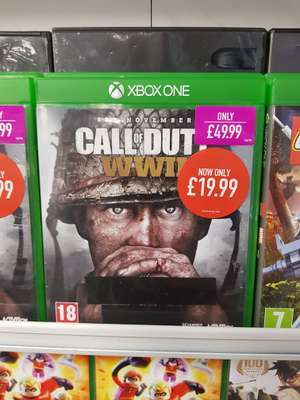 Possibly the last CoD with a campaign? 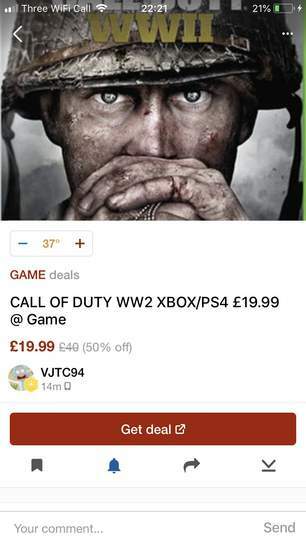 Possibly the last CoD with a campaign?Heat added. Awesome. Updated with your link. Thanks. I agree. My favourite of is World at War so hopefully I'll enjoy this. From what I heard, BLOPS 4 will consist of Battle Royale and Multiplayer. No campaign. I agree. My favourite of is World at War so hopefully I'll enjoy this.From …I agree. My favourite of is World at War so hopefully I'll enjoy this.From what I heard, BLOPS 4 will consist of Battle Royale and Multiplayer. No campaign. Just checked and it's £15 at CEX so what makes it worth £5 for a new copy? I'll double check from my pc shortly. ?? Link seems to work fine...I'll double check from my pc shortly. It sends me to the mobile site which I don’t want. I will pick this up at one point. Coming down a lot now. Black Ops 4 = LOL = NOT BUYING. They need to either stop or release less frequently the COD games... used to be a big fan of COD and it was always an insta buy but not partaken in the past few. I got Infinite Warfare for £0.00 and still not played it! Each to their own and all that jazz. Why is the picture of crash trilogy? Not on mine mate unless it’s sarcasm ? You've got a crash trilogy malware infection? How on earth is this a hot deal? This game has not only been this price for months but it’s also cheaper almost everywhere else! How on earth is this a hot deal? This game has not only been this price …How on earth is this a hot deal? This game has not only been this price for months but it’s also cheaper almost everywhere else! At the time, I did a quick Google/HUKD search and could not find it cheaper anywhere else for a new copy. Otherwise I wouldn't have posted it. FYI, last post for a new copy. -that unique smell you only get with CEX. If you ask nicely they will get you a good disc I usually buy all my games brand new from release dat but if i want a pre-owned game i just ask for a good copy and they don't mind at all. Also if you go to GAME they will put it in the disc machine for free if you ask without paying the insurance as a one off. But you have to do this at the time of buying a disc and before they seal the box with a sticker. Also if you go to GAME they will put it in the disc machine for free if …Also if you go to GAME they will put it in the disc machine for free if you ask without paying the insurance as a one off. But you have to do this at the time of buying a disc and before they seal the box with a sticker. Some of us might just enjoy that fresh factory smell you get from breaking the seal on a new copy. Some of us might just enjoy that fresh factory smell you get from breaking …Some of us might just enjoy that fresh factory smell you get from breaking the seal on a new copy. i already have an addiction! i buy a new game pretty much every week! :P But, what i was getting at.... Does the game include any DLC that a pre-owned copy wouldn't? :P i'm not a huge fan of COD anymore so i'd rather save some money. If you ask nicely they will get you a good disc I usually buy all my …If you ask nicely they will get you a good disc I usually buy all my games brand new from release dat but if i want a pre-owned game i just ask for a good copy and they don't mind at all. i already have an addiction! i buy a new game pretty much every week! :P …i already have an addiction! i buy a new game pretty much every week! :P But, what i was getting at.... Does the game include any DLC that a pre-owned copy wouldn't? :P i'm not a huge fan of COD anymore so i'd rather save some money. Don't we all! Yeah, no extra DLC so I guess down to preference. I've had fairly decent luck in-store at CEX, always give the disc a clean for me and 99% of the time find a case that's fairly decent. Avoid buying online though. Their idea of mint condition is a disc that's scratched to ***** and a case that looks like it's been sat on by Pavarotti.